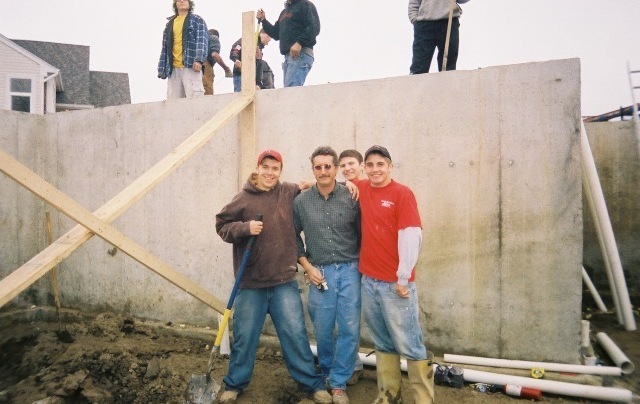 This picture was taken back when I was a construction teacher at one of the local high schools. We had just started building this house and we were doing the underground work for the drainage system. You can see that the poured concrete foundation walls are baced to avoid any damage during back-filling. The white PVC pipes are for the underground drainage system that direct the water to a sump pump. Michigan basements are prone to leaking because the PVC or clay drain pipes become plugged, water backs up and the basements leak. Clay soils in the Detroit area also contribute to the leaking of basements. All basements eventually leak. In this class students learned about fundamental engineering concepts, geology and drainage. Being a vocational education teacher, I know that hands-on "field experience" is critical to learning. This is a video I made while doing a home inspections in Macomb County. This type of rot and mold damage is very common in Detroit area homes. Leaking water, high humidity, no vapor barrier and improper ventilation all contribute to this type of damage. Decks are one of the most dangerous areas of a home. 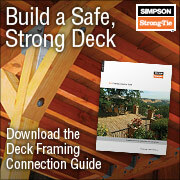 This deck was improperly attached to the house and it collapsed. 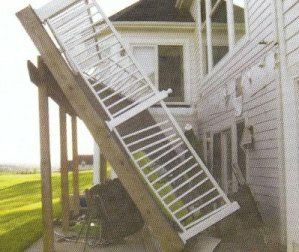 Decks should be bolted to the side of a house and the bolts should anchor into the structural members of the house, not just the sheathing. This is a video I made during a Detroit Home inspection. The video shows very common structural issues with old garages in Metro Detroit. 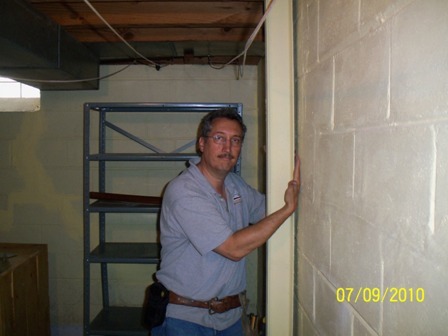 This picture was taken during a Grosse Pointe home inspection where the foundation was repaired/braced with a steel I beam. However, the I beam was not actually touching the block wall it was supposed to be supporting. The I beam may have been touching the wall at some point but the soil on the other side of the wall may have contracted due to drying out causing the wall to spring back outward. When there is a gap between the I beam and the wall, it can be filled with mortar or grout. This drawing shows an I beam supporting a bowing basement wall. This condition is common in michigan block basement walls. As a Metro Detroit home inspector, I see this condition in certain areas of the metro area. Harper Woods and Grosse Pointe have deposits of heavy clay soil between 7 and 8 mile and west of Mack Ave. Manchester street in Grosse Pointe and Old homestead in Harper Woods have homes with bowing foundaiton walls. The clay soils found in some areas of the Detroit metro area put tremendous pressure on the walls. Block walls will generally crack in the center with a horizontal crack in the mortar joint. 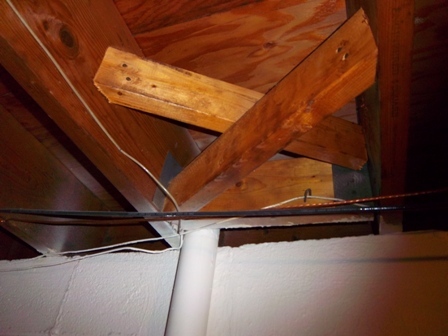 Experienced Detroit area home inspectors are aware of information like this. I see a lot of poorly done foudation rapairs. 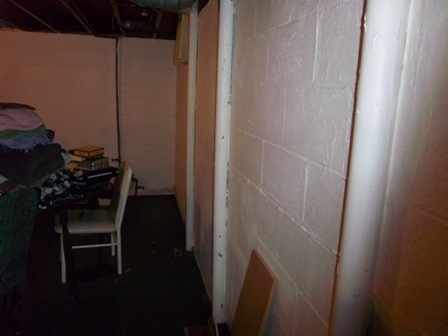 This pictures shows round steel columns supporting a bowing basement wall in Grosse Pointe. These types of columns are meant for supporting a load from above, not from the side, and the round poles were bending from the enormous amount of pressure on the basement walls. Instead of round columns, they should have used steel I beams. This repair will have to be done again and will cost thousands of dollars. During this inspection I saw these round support columns which were also poorly supported at the top. I am looking through my photos to find a well supported column and will post it here when I find one. 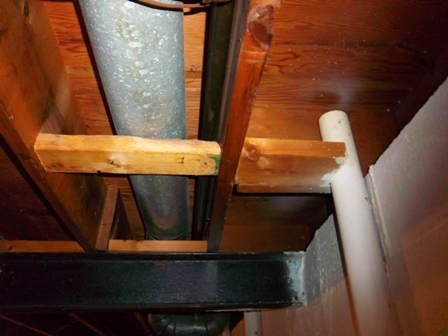 Again, steel column supporting a bowing basement wall is poorly supported at the top. Wrong type of steel support + wrong bracing = failure of repair. This is a video of a fairly well done foundation repair. Note the bracing at the top is done pretty well. I have seen a lot structural problems with buildings however, I have seen just as many improper repairs to structural issues. In the past, I pointed out the structual issues in my reports and advised the customers to hire a "qualified contractor to evaluate further for repairs." However, seeing too many improper repairs has changed my thinking on this issue. I now advocate getting an engineer involved to design and over-see the correction of many structual problems with buildings. 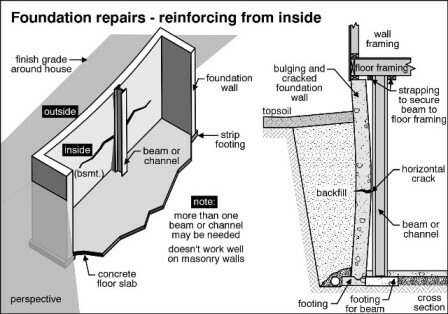 Not every repair requires the expertise of an engineer but structural problems are too costly to do twice, so getting a little expert advice prior to repairs is well worth the money. 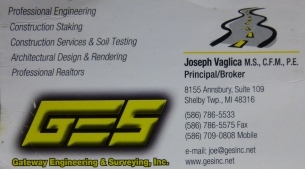 Joe Vaglica is a Civil Engineer and PE and is one of the people I recommend to evaluate and design solutions to structural issues. Click on Joe's card shown at left to go to his website.